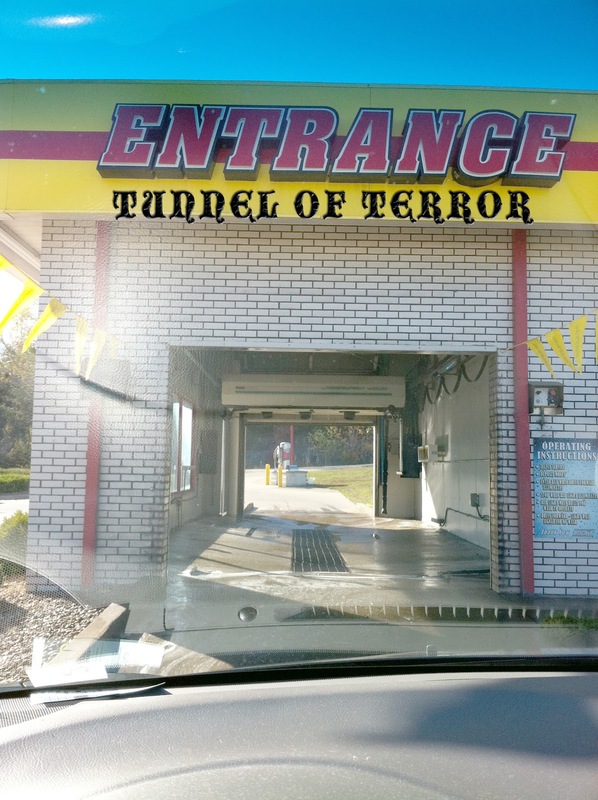 The girls love going through the car wash. LOVE. Not sure why I'd ever spend the money to take them to Disney World. Ten bucks buys them ten minutes of real good fun. They bounce through the car, giggling and ducking from the sprayers. They really find this thrilling. Not sure they could even handle the excitement of Disney World - their little heads might explode. Turns out yesterday, it was my head that nearly exploded in what will henceforth be known as the Tunnel of Terror. I drove in and Cameron and Hadley unbuckled and took their position by the window. As Hadley plowed herself over the seat, she knocked Cameron's Gatorade with her knee and it went flying through the van. Cameron proceeded to cry about her empty bottle while Hadley screamed that it wasn't her fault. I could've washed the van myself with all the tears that were flowing. I tried to distract them by pointing out the colored soap, but by this time they were too busy fighting. Cameron decided to escape her sister's screaming by climbing on my lap. In the process she stepped on my ipod, which was laying on the console and cracked the case. Now I was angry. I sent them back to their seats and told them to get buckled. All the while.....well, poor Jack. 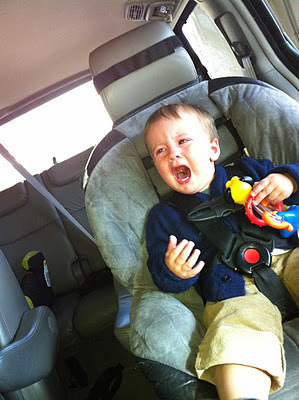 Poor poor Jack was terrified of the car wash. Every time a nozzle swung his way, he'd scream and cover his face. I tried to calm him down, but my efforts were worthless. I'm not sure he could even hear my voice over his sister's sobs. So, I did what any good mom would do - I snapped a picture. We pulled away with the outside of the swagger wagon looking nice and new. The inside however was filled with tears, screams, broken electronics, and gatorade. Hope that clear coat wax lasts a good long while.....I wouldn't drive back through that nightmare if it was free.